Since 2013, the conflict in the Central African Republic (CAR) has repeatedly made international headlines, with alarms being raised over the escalating violence and even precursors to genocide in the country. Ethnic purges and other mass atrocities continue to take place on a near-daily basis against entire communities. A great, but unknown, number of civilians have died in the conflict and the instability has led to a major humanitarian crisis. In May 2018, the United Nations High Commissioner for Refugees (UNHCR) announced that an unprecedented 1.27 million people have been internally displaced or forced to flee the country. Over the past 20 years, there have been a growing number of initiatives aimed at ending the CAR conflict, but these have had little impact. The country has seen a series of peace, disarmament and amnesty agreements; long-term UN peacekeeping missions and humanitarian assistance; foreign military operations; and elections. Billions of dollars have been spent in an attempt to restore stability and compensate for the lack of state control. Since 2014, the UN mission in CAR, also known as MINUSCA, has cost more than $3.2 billion. The European Union, a long-term and major development partner in CAR, has also disbursed nearly $200 million during the same period. Despite these efforts, the various mediation initiatives have failed to obtain a political compromise sufficient to manage the simple respect of a ceasefire. Today, there are multiple armed gangs, self-defense and politico-military groups that control or exercise influence across the entire national territory. Worse yet, the perpetrators of atrocities are recognized by regional and international actors as legitimate political interlocutors with whom dialogue is necessary and peace must be negotiated. In August 2018 the African Union announced the end of a series of meetings with representatives of 14 armed groups to record their claims, even though some of the leaders have been placed under sanctions by the United Nations (UN) and the United-States (US). The African Union presented a list of more than 100 demands made by armed groups, including power sharing and amnesty. At the same time, a parallel dialogue was initiated by the Russian government, which invited to Khartoum the military leaders of the most violent armed groups active in the CAR conflict for almost a decade. Today, these so-called dialogues aimed at ending the deadly war have been captured by the agenda of perpetrators of mass atrocities who have shown no intention of making peace. Between 2016 and 2018, The Sentry investigated one such armed group representative, Abdoulaye Hissène, a notorious warlord involved in CAR’s conflict for almost a decade. Formerly a diamond and gold trader, and since 2009 the leader of various politico-military groups, Hissène has been recognized as being responsible for an attempted coup in late 2015 and for targeted violence against UN and humanitarian staff. Since 2017, the United States, then followed by the full UN Security Council, have decided to impose sanctions through an asset freeze and travel ban. Chad announced it had implemented these sanctions, and the CAR government issued an international arrest warrant for him in 2016. Despite these measures and several attempts to arrest him, he remains a free man. The Sentry’s investigation also reveals that Hissène has been successful building a profitable business and even since he has been under sanctions. He has amassed a fortune out of devastating sectarian violence. By inciting hatred and sowing divisions between ethnic and religious communities, he has gradually become a central player in the country’s conflict. Hissène’s rise has been possible thanks to strong ties he has developed over time with national and regional heads of state, their close allies, and with foreign business partners. In 2014, amid the ethnic cleansing of the Muslim population in CAR, Hissène enjoyed diplomatic status and traveled abroad, notably to Cameroon, the Republic of Congo, Chad, Kenya, United Arab Emirates, Switzerland, and France. During these travels, he expanded his list of partners and created lucrative business opportunities. At the end of 2014, after being fired from office and formally joining the armed opposition movement, he declared to the Chadian and Congolese heads of state that “what we want is to destroy everything to rebuild the country.” He also convinced a Swiss oil company that he would be able to secure an oil contract with the Chadian national oil petroleum company. Acting as a “minister” and a leader of armed groups, and advertising his control of rich mining sites, Hissène has also developed an illicit trade in diamond and gold, particularly in Cameroon and in Kenya. Hissène’s rise illustrates a violent system endemic in CAR, and similar to other countries in east and central Africa, that incentivizes conflict over peace. War profiteers and their allies hamper political and peace efforts, since conflict and state collapse are seen as lucrative business and smart politics. Sectarian violence is used as a political negotiation tool and actors who chose to pursue peace are largely kept out of negotiations. In this system, the greater the perpetrators of atrocities and their accomplices represent a threat to the central power, the more they will become essential political interlocutors and increase their financial gain. In 2015, the UN Security Council took a strong step when It decided to impose sanctions on a diamond company, Badica/Kardiam, accused of financing armed groups at the peak of the 2014 crisis. Despite this positive step, no other entities or businessmen faced any consequences for their role in the financing of the deadly conflict. 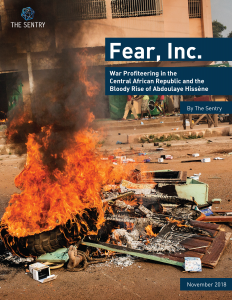 By focusing on Hissène to illustrate war profiteering, this report calls for an in-depth reassessment of the strategy to support the emergence of CAR from its crisis. As long as violence is profitable for those behind the atrocities and their business networks both inside and outside the country, long-term peace in CAR and the rest of the Central African region will remain an illusion. It is time to send a strong signal to war profiteers so that their crimes will be less lucrative and bear increasingly costly consequences.